There has been a material slowdown in China’s growth rate in recent years which in part is due to regulatory upheaval in the shadow banking sector. Here we offer an update on the fine balance achieved to date by Chinese authorities between boosting the resilience of the financial sector by curbing growth in shadow banking while preventing a deep credit induced economic slowdown. Australian mining companies have benefited from a 70% lift in global commodity prices - as measured by the RBA’s Commodity Price Index in Australian dollar terms - since they bottomed in late 2015. The upswing in the commodity cycle has occurred despite a gradual easing of China’s growth in recent years to around 6.5% in 2018. A number of factors have contributed to the recovery in commodity prices, including the lagged effect of a substantial pull-back in capital investment by global miners as well as a boost to steel sector profit margins in China associated with a government sanctioned cut to industrial excess capacity. A reduction in such capacity was one of the key policy objectives enunciated in late 2015 by the Chinese authorities as part of their Supply Side Structural Reforms. Another key objective was a reduction in corporate sector leverage. After growing strongly post the financial crisis, the ratio of corporate debt to GDP has levelled off in recent years at 160% (see RBA Bulletin, China’s supply-side structural reform, December 2018). One of the key strategies to facilitate corporate sector deleveraging has been to tighten the oversight of non-bank financial intermediaries or shadow banks. 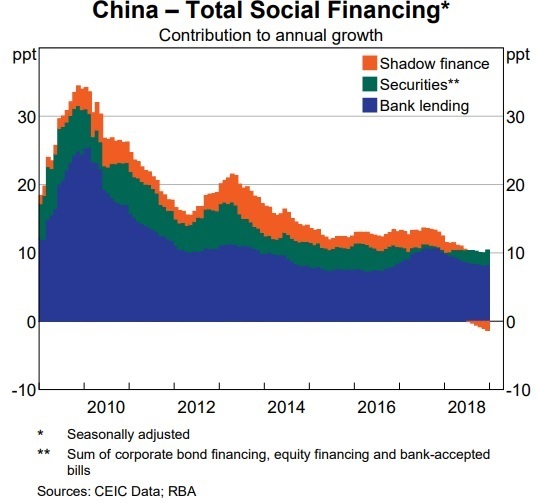 The rapid growth and importance of China’s shadow banking sector has its antecedents in the massive fiscal stimulus designed to mitigate the effects of the financial crisis. The supply of traditional credit channels was unable to meet demand, which opened the way for shadow banks to cater to the additional demand. 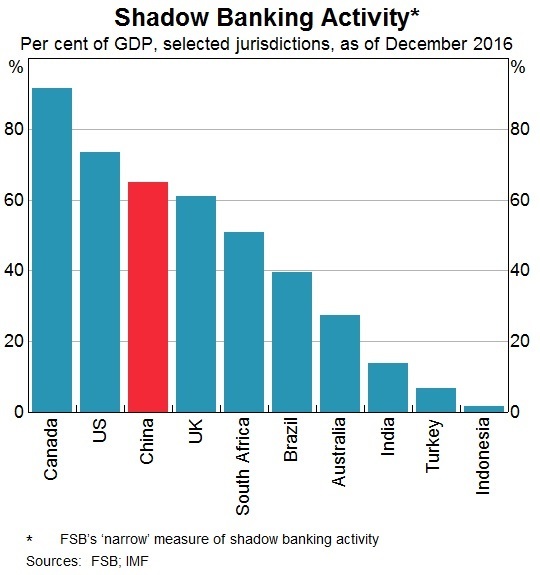 Consequently, growth in shadow banking assets outpaced traditional bank assets in the wake of the financial crisis and by the end of 2016, accounted for over 60% of GDP, comparable to the United States and United Kingdom and higher than most emerging economies (see charts below). The shadow banking sector helped to diversify risk, opened up another channel for credit supply and offered higher rates of return than traditional bank products available to households. Nonetheless, the authorities became increasingly concerned by the growing importance and influence of the shadow banking sector because it undermined the central bank’s efforts to control the supply of credit, facilitated higher leverage, offered credit to increasingly marginal and less credit worthy borrowers and increased the financial system’s vulnerability. Post the financial crisis, it is estimated that half of China’s banks that were state owned were able to circumvent lending regulations thanks to the shadow banking sector. Up until 2015, China’s central bank focused on controlling the flow of credit in the economy through M2 and bank lending. But they had little influence over NBFIs, which continue to expand their assets rapidly as cited above (see Chen, Ren, and Zha, December 2018, The nexus between monetary policy and shadow banking in China, American Economic Review). NBFIs were not subject to the same prudential capital requirements as traditional banks. Their loss absorbing capital ratios - the amount of equity finance on their balance sheet as a share of total or risk weighted assets - were lower than traditional banks. Their funding ratios are also typically less stable because they rely more heavily on short term liabilities to fund long duration assets such as corporate loans. The duration mismatch would increase their exposure and vulnerability to a fall in the underlying value of their assets, with an attendant higher contagion risk. 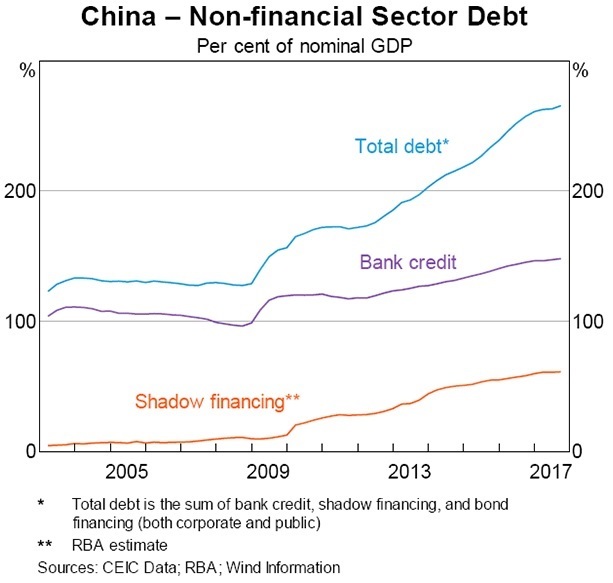 Chinese authorities responded by establishing the Financial Stability and Development Committee, designed to improve regulatory oversight of shadow banks, and imposing restrictions on the ability for traditional and shadow banks to manufacture and sell to households risky securitised vehicles such as Asset Management Products and Wealth Management Products (see RBA Bulletin, Non-bank financing in China, March 2018). According to the RBA, these reforms had the desired effect of sharply slowing growth of banks' lending to NBFIs, including through WMPs. In the past year, growth in shadow banking assets has declined after growing strongly for over a decade - see chart. The reforms implemented in recent years have had the desired effect of slowing growth of the shadow banking sector and reducing systemic risks associated with an unsustainable build of up economy wide leverage, particularly in the corporate sector. Through a combination of good luck and good management, the tightening of the supply of credit has contributed to the slowdown in China’s growth but not derailed the economy. The near term outlook for China depends in part of the ability for the authorities to continue to manage systemic risks without causing a recession. Ultimately, a safer and more robust finance sector will benefit not just China but the rest of the world. Good to read an authoritative, clearly written macro overview. Be glad to second those comments Eleanor. Many thanks Sam. Neville.